Lukimbi Safari Lodge is a 5 star Luxury Safari Lodge situated in the southern portion of the Kruger National Park, South Africa. Game drives with informative Rangers, are done on the Lukimbi private Concession area in the Kruger Park on its private road network, in 'open' Land Rover Safari vehicles. Guests can alternatively take guided walks in the bush with armed Rangers. Lukimbi Safari Lodge is the place to relax with magnificent views over 15,000 hectares of exclusive use game reserve, part of the Kruger Park. 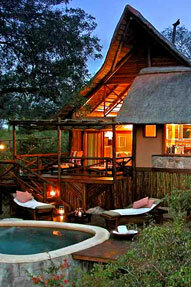 Lukimbi Safari Lodge has 16 tastefully decorated luxury suites, all with private sun decks and river views. The superior Giant Eagle Owl and King Cheetah suites, each have in addition, a plunge pool, dining room and two bathrooms en suite. All Lukimbi's suites are air-conditioned, with ceiling fans, lounging area, bathroom with outdoor shower and separate toilet, (all these with panoramic bush and river views), mini bars and a tea and coffee station. The raised walkways provide guests with safe and easy access to their suites from the main Lukimbi Lodge. Lukimbi Lodge is decorated featuring the mythical creature Lukimbi. The Lukimbi Lodge's main buildings are linked together by open wooden decks, which afford a lovely view over the ephemeral Lwakahle River and the bushveld beyond. With Lukimbi Lodge having been constructed relatively high above the river, this provides panoramic vistas. Animals are almost always in view, coming to the river to drink or feeding on the browse and graze close to the water. Lukimbi Lodge offers guided open vehicle game drives, early mornings and late afternoons into the evenings. 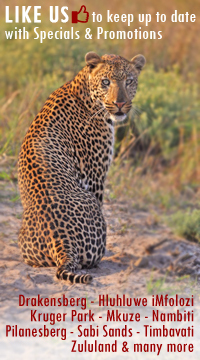 Guides love to share their extensive knowledge, and work closely with our Shangaan trackers to get the best sightings. All makes for interesting and fruitful viewing. Vehicles are allowed off-road to make more of possible big cat sightings. This way guests are able to get really close to these animals and experience truly fantastic open clear photographic opportunities. Early morning drives, particularly in winter, can be cold, a stop is made during the drive for warming drinks and a rusk or snack. The Sundowner stop on the afternoon game drive, is the time to appreciate the beauty of a Kruger Park bushveld sunset, whilst sipping ones sundowner drink. Lukimbi Safari Lodge is the place to enjoy guided walks in the bush, it is quite a different experience to see animals on foot and can be extremely interesting. The walks offer the opportunity to look at and learn about the smaller things, to appreciate the smells of the African bushveld of the Kruger Park, and one has the opportunity on the walks, to listen to the calls of the various species of birds encountered. Well not always the smaller things. One of the walk options, is to visit the nearby Crocodile River and here one gets to see some of Africa's larger animals, hippo and crocodile. Walks are generally taken after breakfast and guests are always accompanied by armed Rangers. The Lukimbi Game Rangers are keen to discuss topics in their field of expertise. Talks are also given on the culture of the local communities outside the Kruger Park. The Rangers have set up a small museum in their office at Lukimbi Lodge, where guests are invited to have a look and to discuss the exhibits.